All delightfully fresh performances in a satisfying programme. (...) die zumeist aus den siebziger Jahren stammenden Stücke bahnen sich mit ihrer beinahe volksliedartigen, indes nie heimatkundlichen Attitüde einen ganz direkten Weg ins Gemüt. (...) eine aus den Urgründen emporsteigende Einfachheit, ein Schöpfen aus den geheimnisvollen Tiefen hinter der Politur, eine Rückbesinnung auf verschüttete Kräfte der geistigen Natur. 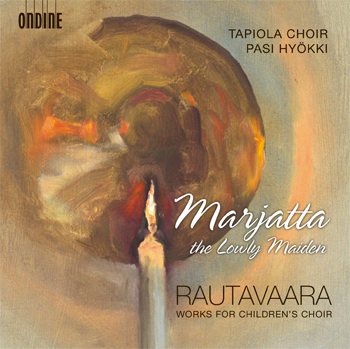 This CD features works for children's choir by Einojuhani Rautavaara, mostly written for and here performed by the world-renowned Tapiola Choir under their music director Pasi Hyökki. These pieces cover a wide range of topics and moods, extending from humorous nursery rhymes to more serious philosophical issues and religious solemnity. The album title piece is the one-act choral opera Marjatta matala neiti ("Marjatta the Lowly Maiden") for soloists, children's choir, and instrumental chamber ensemble, based on a poem from the Kalevala epos. The half-hour "mystery play" tells the story of Marjatta who becomes impregnated after eating a lingonberry and gives birth to a son - thus the Finnish mythological adaptation of the Christian story of Jesus' conception and birth from a virgin. Finnish cult composer Rautavaara is one of the rare composers to have written extensive and substantial repertoire for children's choir. More generally, his major output for mixed and for male choir has cemented his position as one of today's most popular composers of choral music.